This is a common and widespread plasmodial slime mold. It is found from June through November, usually in groups, sometimes scattered, on well rotted logs and other dead wood. 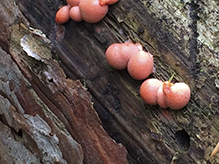 The fruiting body is a plump, pillow-like mass (aethalium) of protoplasm enclosed in an surface crust. It looks like a small puffball. Each aethalium is globe-shaped to hemispherical and ⅛″ to ⅝″ in diameter. It is pink at first and filled with a pink paste that has a texture often compared to toothpaste. As it matures it becomes yellowish-brown to olive brown, darkening as it ages. The interior of a mature aethalium is a dry, powdery, pinkish-gray mass of spores. The taxonomy of slime molds changes frequently—it is a work in progress. ITIS (originally referred to as the Interagency Taxonomic Information System) places all slime molds in the Fungi kingdom. That is no longer accepted. 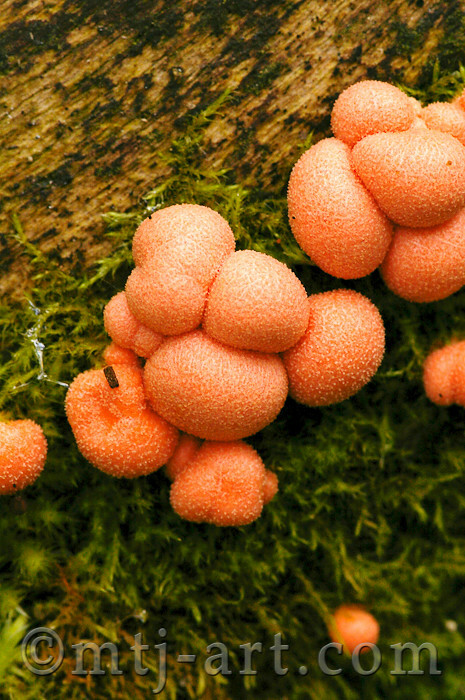 ITIS places wolf’s milk slime mold in the Reticulariaceae family. National Center for Biotechnology Information Search database (NCBI) places it in the Enteridiidae family. Index Fungorum places it in the Tubiferaceae family. 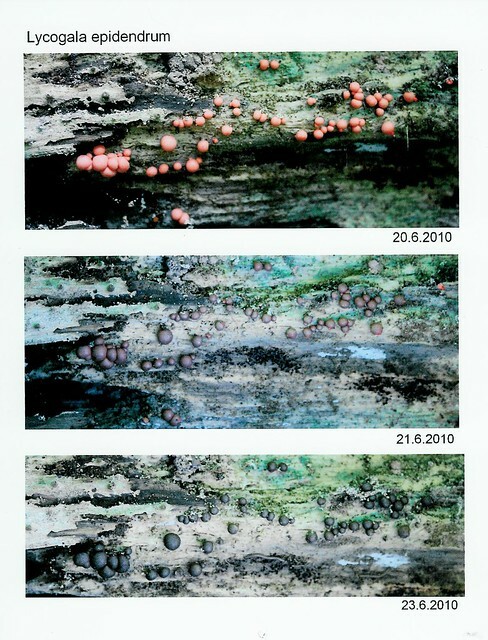 ITIS has spotty coverage of fungi species. NCBI is usually reliable but has the following disclaimer on every page: “The NCBI taxonomy database is not an authoritative source for nomenclature or classification - please consult the relevant scientific literature for the most reliable information.” Index Fungorum should be considered the final word on the taxonomy of fungi. The large, pillow-like, fruiting body with an outer crust of some slime molds, formed by the fusion of many plasmodia into a single functional mass. Plural: aethalia. Little round, reddish pink balls. Exudes pinkish-grey paste when popped. Listed as inedible. This specimen was located in central missouri. These pink blobs represent huge single celled Wolf's Milk or Wolf's Blood slime molds with thousands of nuclei that reach this size following long periods of feeding on bacteria, yeast, etc. The feeding stage is called a syncytium and the aethial stage is the reproductive stage where the mold goes a brown colour and changes into thousands of spores that are dispersed by wind, rain, etc.